Nico and LaLa: A Traditional Wedding...with a twist! A Traditional Wedding...with a twist! We had the privilege of working on one of the most GORGEOUS weddings ever, last fall that we thought we would share with you all! This was another client we worked on with The Social Office, based in Nashville. If you saw our recent post on Facebook about being mentioned on the fabulous Bonjour+Hola blog, you saw where Julia Spickard, the bride, was doing a week of guest posts on all things wedding! Check it out here if you missed it! 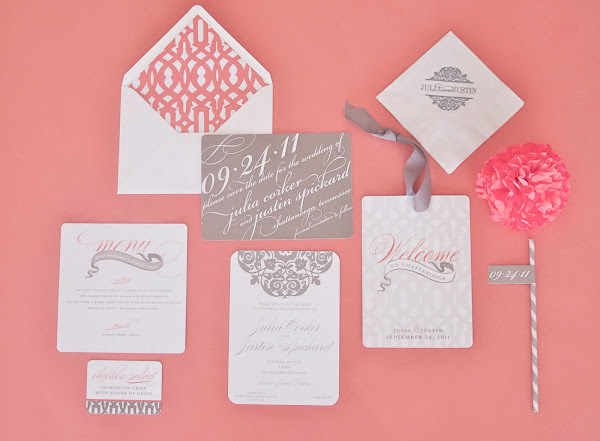 Julia had a very consistent theme of gray and white through out her wedding and we did a few minor pops of coral. This was a formal and traditional wedding, but with a little creativity we added a few Nico and Lala twists every now and then! HA! 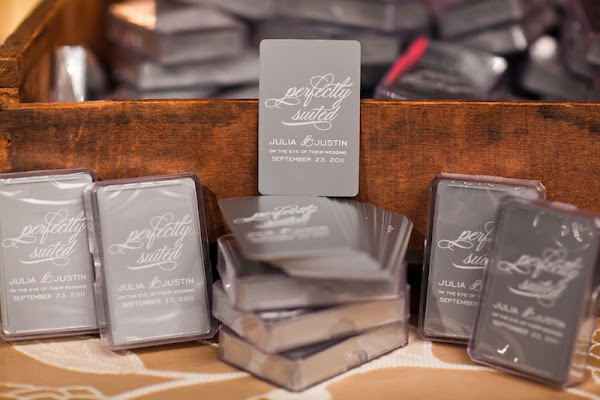 We began with the save the date and carried the gray and white theme throughout! 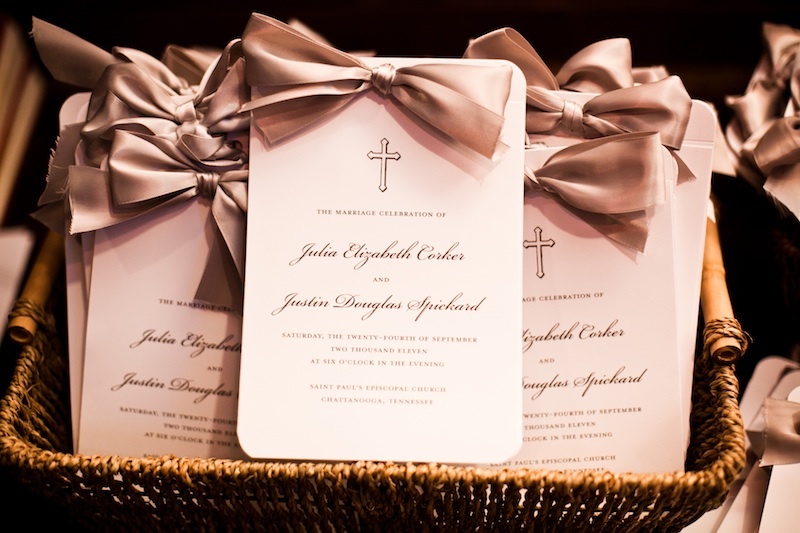 Love the programs with satin gray ribbon....elegant and stunning! 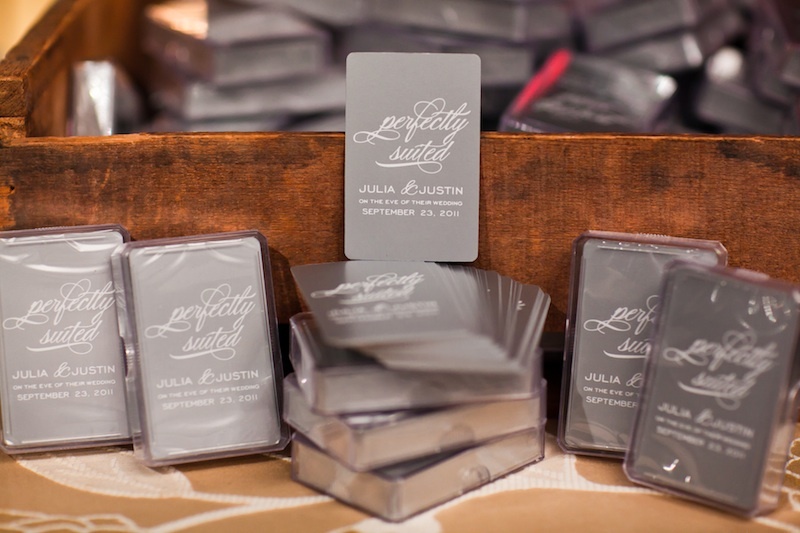 We are a little obsessed with the playing cards we designed for the welcome bags!!! Perfectly Suited...ADORABLE!!! 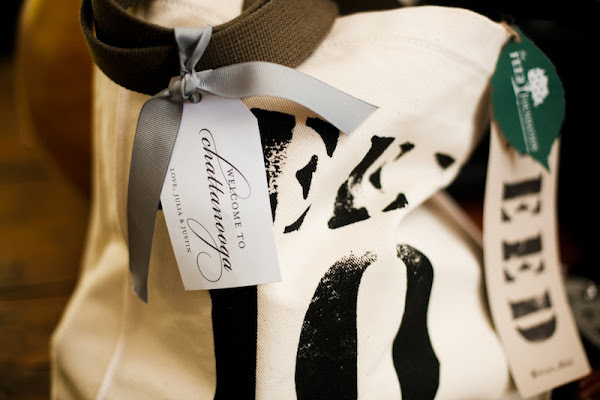 How neat is it that they did the welcome bags in FEED bags?! We love that! Our custom tag still made it cohesive and well branded, but it was a personal cause that was close to the bride's heart! 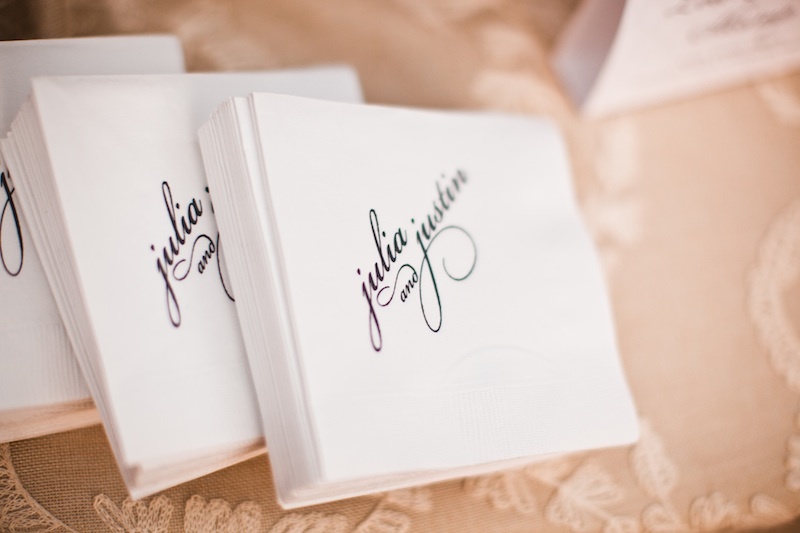 J Crew Flip Flops at the reception for guests to put their dancing shoes on! Such a great idea! And these photos are all courtesy of (except the first one...that is alll Lala! HA!) 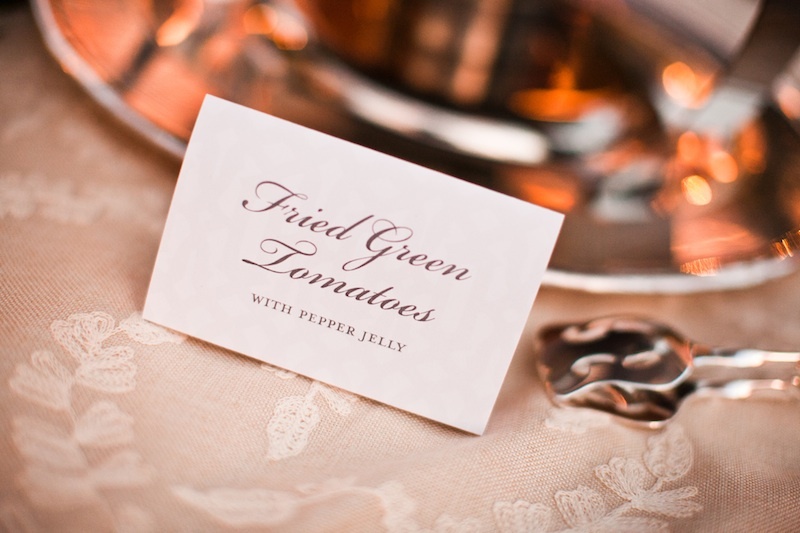 Zach and Jody Gray Photography. They are incredible and if you have never heard of them, check them out for sure!!!! We hope you love this look! We sure do :) We are working on so many weddings right now and cannot wait to get all the photos back so we can share with all of you lovely blog readers!! Also, the countdown is ON for the Ipad covers. I swear--you all are going to DIE at the cuteness. There is definitely a look for everyone and we are hoping to have them up on the site on the next week! We will be blasting it out once we do! It is another beautiful day here in the Windy City and we may stroll down to JCrew on Michigan Ave in a bit--we have been eyeing some bathing suits there, and we leave for Hawaii in 2 weeks!!!!!!! AHHHH! The pics are going to be incredible. We will blog for sure and share. We are BEYOND excited about it. Lots of fun things going on in our world and big things to look forward to--and don't you just love spring??! Tulips and sunshine!!! Yes, please! May I ask who did the invites, they are beautiful. What a beautiful wedding arrangements, even your wedding invitations are also looks fabulous. Are these Wedding venues Chicago? It really looks incredible on all the images. Harper Turns One...A Pastel Party!